Once again, thank you to all those who took part in Sepia Saturday 12. Sharing our family histories is becoming quite compulsive and we know from all the comments and e-mails we have received that everyone seems to be enjoying all the weekly posts. Sepia Saturday 13 will be on Saturday 27th February so please sign up if you are taking part. 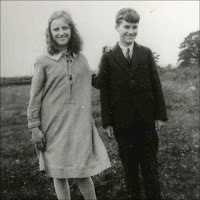 Our sepia picture to accompany this call is taken from the Sepia Saturday post of British writer and blogger Martin Hodges and his Sepia Saturday post last week "Twins". Welcome to Week 12 of Sepia Saturday. Thank you to everyone who made last week such a success : we had a record number of participants and one of the best collections of images and memories we have had since we started. 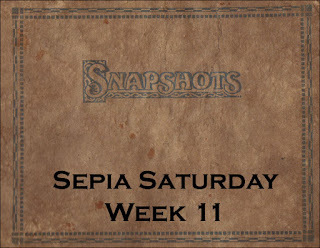 Sepia Saturday 12 will be Saturday 20th February and once again we are asking you to sign up if you would like to participate. Could we also remind you to include a link back to the Sepia Saturday Blog so that your readers can easily check out other Sepia Saturday entries. As an illustration for the weekly call for posts we are going to feature one of the images from the previous week. We will try and work our way around all the participating blogs over time. This weeks' illustration is from Mouse's fabulous Sepia Saturday post "My Wild Irish Rose". Welcome to this call for posts for Sepia Saturday Week 11 (Saturday 13th February 2010) - the first Sepia Saturday to be hosted on our new dedicated Blog. Most of you will be familiar with using these dinky-linky things, but if not, they are quite easy to use : if you are joining in the fun this week, simply enter your name and the URL of your blog in the box below and press enter. Please try to include a link back to the Sepia Saturday Blog in your post so that your readers can then discover the other posts, and please try to visit the blogs of as many of the other participants as you can. 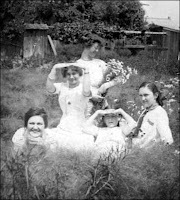 If you have not joined in before the rules for Sepia Saturday are fairly straight forward - the idea is to share our old photographs (they don't have to be sepia). They can be used as a springboard to whatever you want - family history, local history, poetry, prose or whatever - or they can simply be shared with the briefest of descriptions. In order to allow maximum flexibility, there is no weekly theme on Sepia Saturday : the overall aim always remains the same - to share our collective history. A slightly more verbose statement of aims can be found in The Sepia Saturday Manifesto. Let's hope that Sepia Saturday goes from strength to strength in its new home. It would be really useful if regular players could give the launch of this new blog publicity on their existing blogs so that we get as many participants as possible. A MANIFESTO FOR SEPIA SATURDAY. 1. We belong to a favoured generation: the first generation of the digital age. Whilst our ancestors have valiantly attempted to preserve their own unique history in scraps of written narrative and faded and creased photographs, we have the unique ability to fix these memories for ever as our legacy to future generations. 2. Scanning, blogging and digital storage provide us with the means of preserving the past, but we also have a duty to preserve the stories and images of those that contributed to our society as we know it. Whilst we can leave to academic historians the task of documenting the lives of the rich and famous, we believe that the most remote second-cousin and the most distant of maiden aunts has made a unique contribution to the lives that we lead. Each one of us has a duty to help preserve the stories of these builders of the modern world. 3. Whilst images alone are fascinating documents, images with words - be they simple half-remembered names and dates or gripping narrative histories - are even better. The synthesis of image and words provides the most effective insight into the past. 4. "Sepia" is an alliterative convenience rather than a descriptive criterion. Let our images be in sepia, in black and white or in full colour : what matters is the message and not the medium. 5. We recognise that we have not only a duty to share our past but also to ensure that it is effectively preserved. Whilst images printed on photographic paper and words written in old notebooks fade with time, they have proved, in most cases, remarkably resilient over time. Perhaps one of the greatest dangers facing the millions of digital images and the endless pages of computerised words we produce today is that they can so easily be lost by the pressing of a wrong button or by the hacking of a troubled soul. We recognise and we accept our responsibility to back-up and securely save.